Covington Catholic High School student Nick Sandmann tries to suppress a smile after an Indian walks up and starts beating a drum in his face. 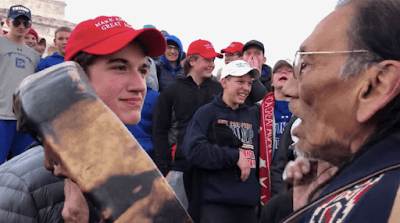 The drumbeat heard around the world continues to reverberate, as social media and newspaper op-ed writers remain all atwitter over images of a smiling Catholic boy wearing a MAGA hat while some Indian pounds a drum an inch from his face. The Smiling Nick Sandmann has been declared a racist and every possible disparaging name imaginable; national figures have urged people to beat him up and he's received a massive number of death threats. His school, Covington Catholic in Covington, Ky., has been portrayed as in incubator of racism and evil. Many commenters retracted their defamatory comments about Sandmann after receiving additional information, but others continue to vilify both him and his school. I happen to believe the smiling Nick Sandmann is a good kid who simply stood in one place while approached by a crazy Indian beating a drum. Video of the event clearly shows Sandman just standing there with a silly grin on his face sort of taking in the surreal situation. When attacked by the Indian he can be seen trying without success to suppress a smile. Holmes, who is gay, was writing about his unhappy time in a Missouri Catholic school during the early 1990s, when homosexual activity was considered a crime in that state. The Catholic church still maintains, rightly or wrongly, that homosexual activity is a sin, so I don't doubt that Holmes may have had a difficult time. But that doesn't make every smiling Catholic schoolboy an evil smirker. The claim has repeatedly and falsely been made that Covington Catholic School is a “segregation academy,” which is quite impossible given that it is located in a virtually all-white county. The argument of leftists making this claim is that Cincinnati whites fleeing school integration moved to various almost-all-white suburban counties. By operating or expanding their existing schools Catholics were therefore operating “segregation academies.” By that definition the local public schools in these counties would be considered “segregation academies,” too. The thought process behind this way of thinking is beyond my ken: you cannot have white flight or a segregation academy unless there is some group to flee or segregate oneself from. In almost-all-white counties there is simply no racial group to flee. My personal experience and common sense tell me that the Catholic schools of Northern Kentucky were not created to promote segregation or avoid integrated local schools. Most of these Catholic schools were founded in the early 1900s with a few going back to before the war. Prior to the Brown v. Board of Education decision about a third of the region's schoolchildren attended parochial schools, one of the highest rates in the nation; obviously they weren't fleeing integration since there was no integration to flee. Catholics often do bad things. They sin. So do Protestants, Jews, Mormons, atheists, and everyone else. Those wishing to criticize any Catholic school or its students will find no shortage of ammunition, but they aren't operating segregation academies. And as a general rule a Catholic smile is just that; it's a smile. There are a plentitude of types of smiles: nervous smiles, happy smiles, sad smiles, conspiratorial smiles, threatening smiles, this-is-ridiculous smiles, and yes, even smirks. Smiling isn't limited to Catholics; people of all faiths smile and sometimes they may even smirk. But those who see every Catholic smile as a smirk are just paranoid. In the end a Catholic school is just that and nothing more, without nefarious intent by those who operate or attend them. A schoolboy who smiles is just smiling. Being Catholic didn't make Nick Sandmann's nervous smile a “smirk,” nor did wearing a MAGA hat. Those who have criticized Sandmann, his school, or his schoolmates have displayed a malevolence of spirit that is frightening. For these evil people I have just one thing more to say: I smirk in your general direction.